It’s the end of the school year for us, and I’m thinking of a few teacher gifts. I am a big fan of cookie mix in a jar. As long as the teacher actually makes the cookies, it’s not going to clutter up a desk, and it’s easy for the kids to assemble themselves. We may be known by now at our elementary school as the cookies-in-a-jar family. But, this year my daughter wanted to do something different for her triathlon running, cult movie watching, kinda geeky, teacher. We browsed the crafty websites for teacher gifts and decided on a binder cover — so he could organize the clutter on his desk (isn’t she nice to notice this need?). Main fabric: 24″ x 12 3/4″. Cut one piece of fabric and one piece of iron on interfacing. Inside sleeves (contrasting fabric? ): 11″ x 12 3/4″. Cut two pieces of fabric and two pieces of iron on interfacing. 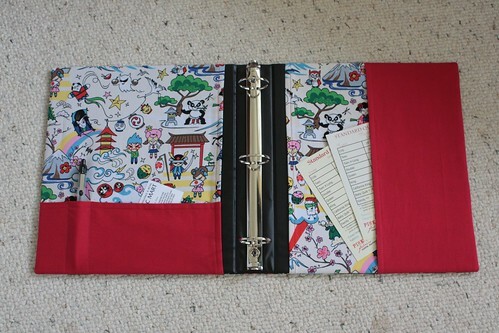 Horizontal pocket: 11″ x 4 1/2″. Cut two pieces of fabric. Vertical sleeve: 6″ x 12 3/4″. Cut two pieces of fabric. Spine facing: 2″ x 6″. Cut two pieces of fabric and two pieces of interfacing. 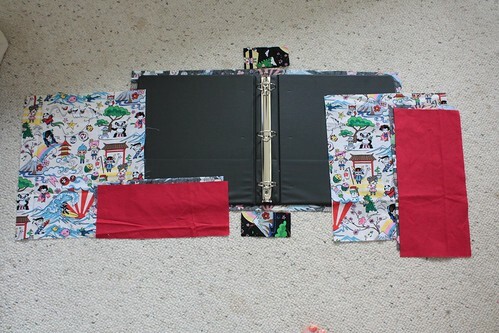 Iron the interfacing to the wrong side of the main piece, inside sleeve pieces, and spine facing pieces. With right sides facing, sew together one long side on the horizontal pocket and on the vertical sleeve. Press with right sides out and then topstitch. 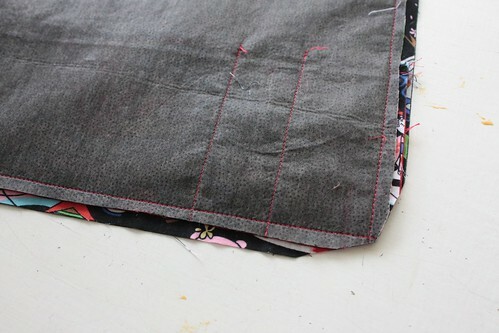 Pin pocket on one inside sleeve piece, and the vertical sleeve on the other interior sleeve piece, aligning raw edges. Fold over 1/4″ and then 1/4″ again on the right side of the inside front sleeve, and on the left side of the inside back sleeve. Press and then topstitch. 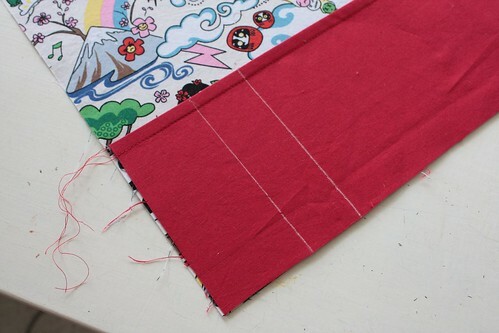 Go slow when sewing over the right side of the horizontal pocket as there’s lots of layers there. Mark vertical lines for pencil pockets on the horizontal pocket. Top stitch. Back stitch for strength at the top of each pencil pocket. Pull the threads to the back and knot for a clean look on the front. Fold over 1/4″, press, and topstitch one long edge on each spine facing piece. Place the main fabric face up. Place the interior sleeves (with the horizontal pocket and vertical sleeve) face down on the right and left ends of the main fabric. Center the spine facings over the space between the sleeves with the long raw edges aligned with the top and bottom of the main fabric piece. Pin everything in place. 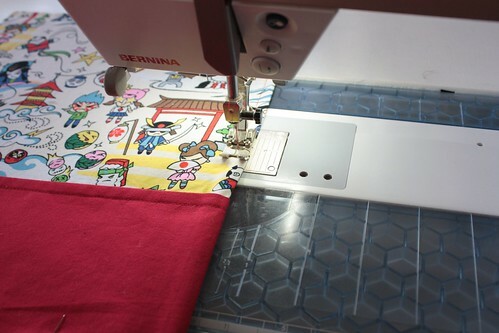 Sew all the way around the perimeter using a 1/2″ seam allowance. Grade the seam allowance (trim one layer to 1/4″), and cut excess from the corners. Turn the binder cover right side out. 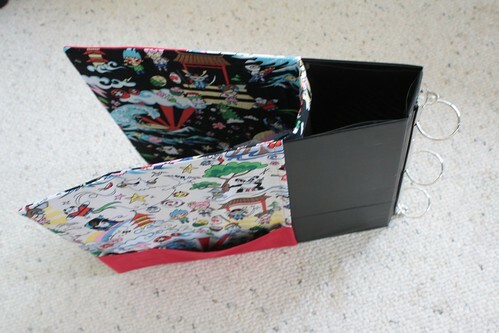 Fold the binder backwards and slip into the cover. Looks pretty good! I was impressed with how easy this came together and how good it looks. Pocket options are infinitely customizable as proven by the myriad tutorials out there. I hope the teacher likes it too. Would you like a chance to win a copy of Twelve by Twelve: The International Art Quilt Challenge? I gave away a copy here on my blog, and now you can hop on over to Crescendoh and win one of TWELVE copies over there (comment at Crescendoh by 5pm PST Saturday May 21st). Check out the artist profiles while you are there too. 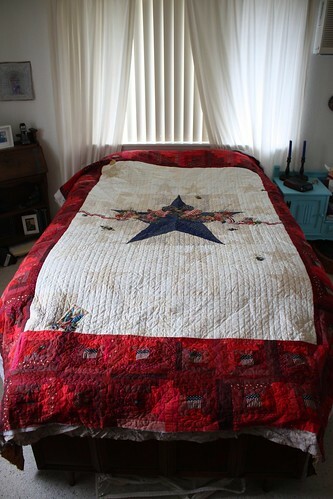 I started this quilt in 2002 as my reaction to 9/11. 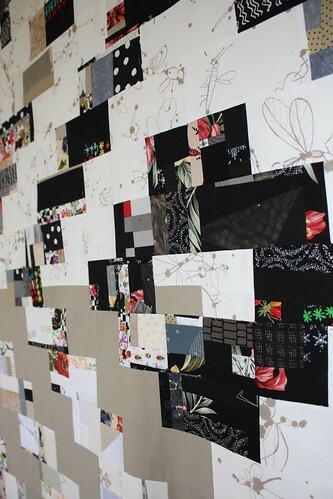 At the time, I was making the transition from more traditional quilts (sticking to existing patterns and gridded layouts) to more organic art quilts. I saw things pretty literally (I still struggle a lot with being too literal). As background, we were living in Wiesbaden, Germany at the time (2000 to 2004). On our previous tour in Germany (1996 to 1999) my husband had deployed on peacekeeping missions to Bosnia and Kosovo and spent a great deal of the time in between on training exercises in the field. We were used to a high operations tempo. I was gaining a lot of respect for, and insight into, the previously-unknown-to-me time that my grandfather served in WWII — so naturally, I was drawn to WWII imagery. I had found a Service Flag in an antique shop in Arizona and it resonated with me. I don’t really know how to explain how 9/11 affected me, other than knowing that the US I knew prior, and had grown up in, was vastly different than the US I returned to on visits post 9/11. I don’t think I mourned the victims, or felt as directly violated as did the rest of the country. Maybe my axis didn’t change so much since I was already removed, having lived in Europe for more than four years at the time, and then another seven years after the attack. Security on post in Germany had already been higher than on posts in the US after the 1998 bombings of US embassies in Africa. Imagine my surprise when we moved to Arizona for 10 months in 1999 and the gate to Ft Huachuca was wide open with the threat level considered “normal.” Normal to me was show your ID card every time you entered and sign your non-military guests in and out. After the 9/11 attacks, overseas posts braced for possible attacks. Though the posts themselves could add more security measures at the gates (like checking every car for explosives — oh the drudgery of getting the babies out of their car seats, opening all the doors and trunk, and standing aside in the freezing cold during those winter checks), housing areas like where we lived were still relatively open. While fencing was being constructed, and a longer term solution was found (hired security guards), we were protected by cement blast barriers, concertina wire, and patrolling soldiers. For many months there was a HMMV parked outside our apartment building (we supplied a lot of coffee to the rotating shifts in that vehicle). I think this was my 9/11 world. Don’t get me wrong — I maintain that the real heroes of 9/11 are the first responders and civilians in NY, the Pentagon, and on Flight 93. It’s just that my world was, and still is, the fallout of the US reaction: the military response. So, something was rattling around in my head. I liked the graphic simplicity of the Service Flag and could easily see it translated into a large quilt. I made sketches and mulled ideas of how to add interest into those large areas of color (plain white with a plain red border wasn’t special enough). Then at the end of the year, my man deployed to Kuwait which would serve as home base for the push into Iraq. I think that’s when I knew I’d need a Service Flag, just like those families in WWII. There are purposely 50 white stars behind the large blue one. An eagle and flags figure prominently in the broderie perse swag, and the red border is made of log cabins which represent home. I worked pretty consistently piecing, appliqueing, and then hand quilting the quilt during the six months TS&WGH was in Kuwait and then the 4-ish months shortly thereafter when he was in Iraq. Then he was home for nearly five years (with annual trips, but not so long and not to war zones) and the emotional push was no longer there. I tired of the hand quilting. We moved to another post in Germany. I turned my attention to landscapes for a solo show. I put the Service Flag quilt away for an embarrassing number of years. Now, nearly a decade later, after a twelve month deployment to Iraq and in the middle of another, the urge returns. I’m feeling like I have a voice in my Army Wife aprons and Medallion quilt. The Service Flag has context again. But my work has evolved. 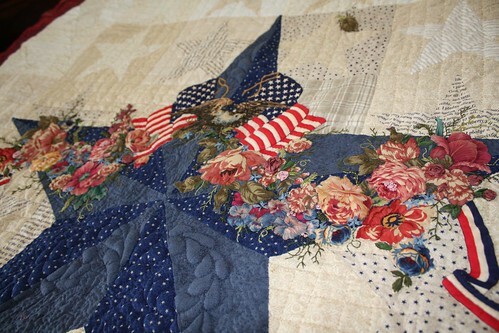 There’s a roughness and a rawness that hadn’t yet come to the surface in the simply patriotic star quilt. 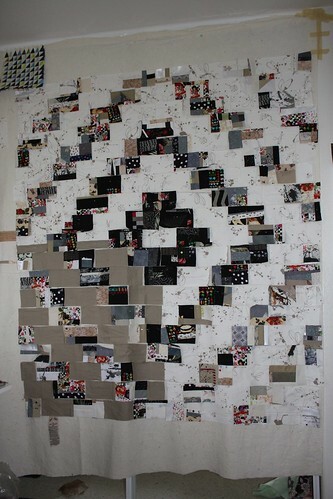 So, I will finish hand quilting the border, which is all that is left, and then use it as a backdrop for a transformation. 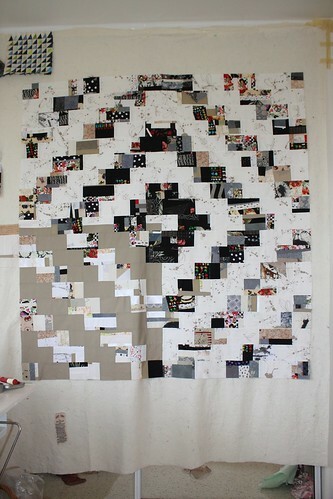 I will do something to this quilt that will allow it to speak on a more even level with the others in what is now a series. 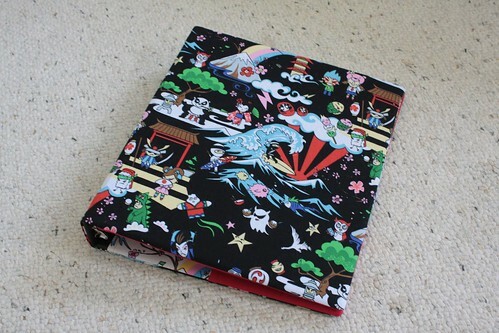 I know, many are groaning that I would possibly deface such a pretty quilt. But pretty wasn’t getting it anywhere other than stuffed in a cabinet for more than five years. As I move forward, and my art evolves, I can’t get stuck on preciousness. War is not precious. I was thinking about writing this on Military Spouse’s Day (the friday before Mother’s Day), and again on Mother’s Day after watching Mrs. Obama and Dr. Biden on the Martha Stewart special highlighting military moms, and finally after listening to an NPR piece on military families. I guess being a military mom with a deployed husband and all it’s attendant business got in the way of timely blogging (smile). One of the things that kept coming up, that I don’t think was answered well, was how can civilians help military families — especially when they are not near a base, or don’t know any specific family or service member. I thought I’d share a few ideas. • FRGs (Family Readiness Groups) were mentioned as a source of support. Most every unit has one in some capacity or another. If you know a family, ask how you can support their FRG. The first time TS&WGH (that’s my Tech Support & World’s Greatest Husband) was in Kuwait/Iraq, one of the moms of a single soldier was thousands of miles away, but supported the FRG by sending goodies for care packages and things like 100 plastic eggs for the family Easter party. We loved her. • ACS is a great on-post resource that you can reach from off-post. The acronym stands for Army Community Service (and I have to believe that the Air Force, Navy, Marines and Coast Guard have similar entities). ACS provides military-life skills classes for families such as how to read the pay statements, help applying for on-post jobs, parenting tips, money management, courses on volunteering and running FRGs, etc. ACS also has loaner kitchen basics for when you first arrive and haven’t gotten your household goods yet. As “den mother” for TS&WGH’s company in 2003, I learned that I didn’t have to have the answers to the families’ problems, I just needed to know where to look for them — and that was most often ACS. Long story short, I’d call ACS at any post and ask how I could help or donate. • Similarly, the USO provides support to the military. They are not only entertainment for the troops. They operate respite areas in airports (we used the Frankfurt Airport USO as a meeting spot if we ever missed visiting family at the arrival gate) often with snacks and phones for troops to call home. They give phone cards to soldiers to call home (Operation Phone Home in partnership with AT&T). They organize travel outings at overseas posts. Donate to, or volunteer for, the USO and you’ll support both troops and their families. • Army Emergency Relief provides interest free loans to soldiers and their families in need. • Volunteer at a VA hospital or clinic. • Make hero quilts through organizations like Quilts of Valor, or Operation Kid Comfort via the Armed Services YMCA. • Donate to the Wounded Warrior program at your closest military facility, or Fisher House so families can be near their wounded service member while he or she is treated. • Scout groups and similar can “adopt” a soldier and write letters. Or, make cards to be sent to troops so that THEY can write home. My kids LOVE getting monthly handmade cards from TS&WGH care of Operation Write Home. • If you are an educator, counsellor, or school administrator, find out if there’s any military kids in your school and talk to them. During TS&WGH’s first deployment here in Hawaii our kids’ school (off post and with low military enrollment as opposed to other area schools that are predominantly military) the school VP had a lunch club for kids with deployed parents where the kids could talk to each other and/or to the school counsellor about how they felt and how they were coping. My son said he appreciated the opportunity and that there was a girl who cried daily in school, but after meeting a few other kids who also had deployed parents she calmed down a lot. • Buy a service member and his or her family a drink or a meal. Just say thanks if that’s how you feel. • My son says that staying busy helps him miss his dad less. I also try very hard to keep the kids’ routines as much the same after daddy leaves as when he’s here. So, keeping those kid oriented activities going is a great help. Is your local sports coach or scout leader deploying? Fill in for him or her so the kids have continuity. I’ve been thinking about what I would want in terms of support from the greater community. Essentially, it came down to thinking about how you’d feel if (or when) you are alone without your usual support system. I get tired of doing everything all the time. I doubt I’d hand over balancing my checkbook to someone else, but I’d happily hand over the vacuum, the kids, or the oven every now and then. So, offering to babysit, or make a meal, or to support an organization that supports military families are all small, but wonderful ways to lend a hand. I know there are many more ways to help. Leave your favorite(s) in the comments if you’d like. OK, maybe not COMPLETELY different. But, I’m taking a break from my “Be Strong” apron while I wrap my head around what I want to do with it’s ties, and wait for an opportunity to go to Fiddlesticks which is full of good stichy supplies (I have problems with making single trips for anything — I finally returned overdue library books today because, after several weeks, I had two other reasons to be on post where the library is). I’m also procrastinating working on my next 12×12 piece, and about a bajillion household related things. Much time is spent staring at the computer waiting for something exciting to happen — like the computer entering all the recipes from my old computer and outdated program to the new(ish) shiny ones all by itself. Or giving my website a facelift automatically too. That would be awesome. I’d settle for it filling out quilt show forms or entering data into my checkbook. My cure for procrastination? The scrap bin. Anything I do with it is an improvement, and little brain power is required. 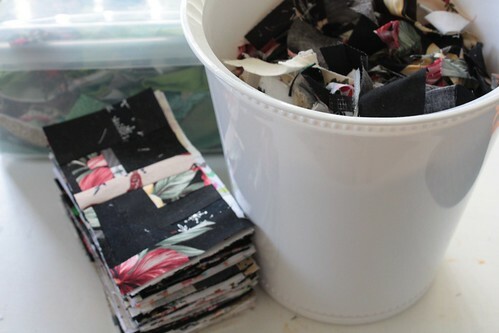 My grand plan is to grab bits from my bins (already color-sorted), sew them together, and cut the “new” fabric into rectangles so I can make a scrappy version of my mom’s blue and white brick quilt. I’ve tackled the blues, the purples (lots of those!) and the blacks and whites. I had enough just from the blacks and whites to make a whole quilt, when paired with a fun white fabric I had set aside for the alternating bricks. 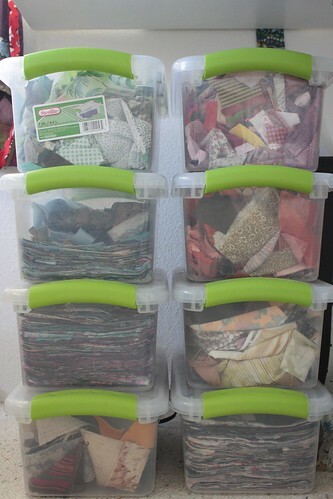 I have about the same amount of purples too, so I’m thinking I’ll pair scrappy cools with scrappy warms instead of scraps and solids, to make a second, related quilt. Chromatic and Achromatic. And look, less than a trashcan of teensy-weensy scraps left over. 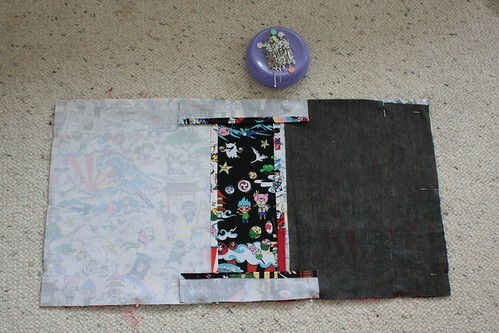 I like the idea of a secondary shape or pattern showing up, so I used a different fabric for one quarter of the solids. It’s way too dark though. 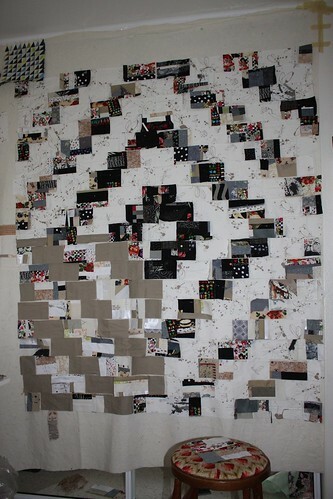 Yet, it matches the pattern on the white fabric, and, since this is a scrap quilt, I’m not going shopping for new fabric. I toyed with painting white designs on the taupe fabric, but just moving the lightest bricks to that quadrant made a heap of difference. This is why it’s so important to move things around and look at their relationships. I had actually set out to make the bricks in a zig-zag pattern, but I didn’t like the way it was looking and so moved on to the Trip Around The World layout. 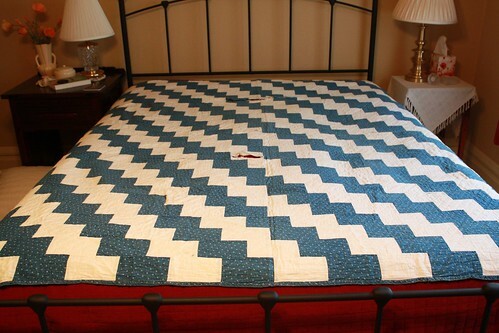 Upon reflection though, I think I’ve figured out the zig-zag and will apply it to the next brick quilt. It probably needs some sort of a border and maybe triangles or spikey shapes top and bottom, but I’m going to let that wait until I get to the Chromatic brick quilt so they can be the same size. Now, it’s back to the stuff I’ve been procrastinating. I’m moving right along on my next apron in my “The Army Wife” series (here and here). I thought I was done, but after some contemplation and input from friends, I think I can improve it. Not this part though — I like this. Mmmm, yummy spicy Indian food! That’s what came to mind with Helen’s palette. Almost immediately I thought of a spice market and those wonderful piles of color. This would be fun to make with all my lovely brown fabrics, but doesn’t it just look like a Brandon Mably fabric (though we all know I love his and Kaffe Fasset’s fabrics)? How about just the spice? A pile of colorful powder that looked like someone ran their finger through. I could do all French Knots in luscious embroidery flosses. I’ve done two knot-heavy projects in the last month though, and I think I need to do something else. Reading up on the odd spice out, I learned that Asofoetida has a lot of medicinal uses in addition to it’s cookery ones. That made me think of an apothecary and all it’s jars, or mysterious drawers. I kind of like this one. I was loving all the names for Asafoetida based on it’s fetid smell. How about a lovely redwork style botanical embroidery, with a bunch of “crappy” names (pun intended)? OK, there’s potential in that design. I was curious about the ancient uses of the spice though. Apparently, it is an inferior version of the ancient herb Silphium, which was so valued in the ancient world that it’s image was used on coins, and it was over harvested to extinction by the Roman era. There’s some speculation that because of Sylphium’s contraceptive effectiveness the heart symbol we use to represent romantic love (that bears little resemblance to a real human heart) is actually based on the heart shaped seed of the plant. It’s also possible that use of Sylphium is the reason there wasn’t a huge population explosion during the Roman Empire despite much improved nutrition and medical care. Connecting the dots from the spice palette, to Asafoetida in particular, I think I can make a case for using it’s cousin Sylphium as inspiration. But what do I want to say? I think I want to say that for millennia, women have wanted, needed, and sought, choices. We need to accept that. But I’m feeling that words are to obvious in a quilted piece — a kind of a cop-out for me. They are much better suited for printed material, or simply the realm of words and letters. Besides, I found a website with bold, thoughtful imagery that is essentially what I was imagining. I need to be more subtle with my Spice piece. I want to convey something visually without having to explain it in words. I want it to be more subliminal as well. I don’t think I need to knock anyone over the head with my Sylphium reference. It can be an intriguing discovery. Now, back to the drawing (sewing) board to see what I can pull off. What kind of fabrics could reinforce my theme? **Upon reflection, I realize what I said about words came out wrong. In THIS instance, the words are better suited for something poster-like and I think I can do better in my little quilt. However, I don’t oppose words on quilts as a whole. 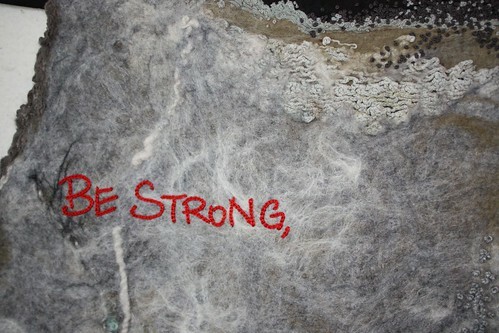 I’ve seen (and sometimes do myself) very effective journalling on fabric and/or words as pattern. I started this post on May Day which means Lei Day here in Hawai’i. Last year we went to the celebrations in town. This year we had a completely unrelated BBQ with friends. The kids have been practicing hula, chants, and ukelele for next Friday’s program at school though. The big to-do however, is The Merrie Monarch Festival. My girl and I have been watching it on TV so we can fast forward through the commercials. The commentary is great, but I’ve been fast forwarding through a lot of it since there’s seven hours each night and I’m not keeping my girl up that late! My favorite for Miss Aloha Hula was Manalani Mili Hokoana English (she ended up winning a very respectable 2nd place). She had such attitude in her ancient hula and was so flirty in her modern one. There was no doubt what the hulas were about. My other favorite women were from Halau Hula Olana. The chanting and dancing are fascinating, but I also enjoy the costumes. References to the time periods and subjects of the hulas via style and color just get better and better the more I learn about Hawaiian history and culture. Plus, I love the way the ti leaf skirts move and the way the starched fabric made to mimic kapa doesn’t move. Only six guys but such a strong presence. The women of this Hālau were pretty impressive too. The men from Hālau Ka Leo O Laka I Ka Hikina O Ka Lā use an ulili, which according to an article I red a few weeks ago, is a rarely used instrument in these performances. Speaking of instruments, the guys of Halau I Ka Wekiu danced a procreation hula that I think dates back (in some form) to King Kalakaua’s coronation. I read in Unfamiliar Fishes that something like this completely grossed out the missionaries present. Gotta include that! Continuing the theme was my favorite Hawaiian singer, Keali’i Reichel’s Hālau Ke‘alaokamaile dancing about the value of gold bars once influence from outside the islands had been established. They won first place. Saturday night featured hula ‘auana, which is where hula has evolved since the time of the monarchy. This is the style most people probably think of when they think hula. My favorite guys were Hālau Nā Pua Me Kealoha from California, who danced in jeans about a Jeep ride. The little guy in the middle is great. I liked Hālau Hālau Ke‘alaokamaile because Keali’i Reichel is so lovely to listen to. But first place winners, Hālau ‘O Kamuela was so much fun to watch. I can’t not mention the jaunty hats of several of the female groups, or the simple, graphic, black and white lei of the men’s group which danced about an albatross, and especially the tribute to Olympian and ambassador of aloha, Duke Kahanamoku (who won, and in my mind paired beautifully with the winning ladies and their Oahu medley). So many wonderful flowers and costumes! It’s been a fun few evenings with the TiVo.